I have always had a bit of a thing for brown tones in the garden. I love it in my floral designs, whether it is with pink, white, yellow, orange, red (does it go with every colour?) but especially blue! When the Toronto Botanical Garden had their plant sale in the spring I picked up heucherella ‘Sweet Tea’. I loved the colour of the leaves, they are a coppery orange and have a burgundy blotch in the centre of the leaf. I am always looking for gorgeous foliage to use in the shade garden. And when I was at the Owen Sound farmers market later that month, one of the vendors had this lovely little viola ‘Karma Blue Butterfly’ for sale. I planted them side by side, the viola has not been out of flower since that day (and I have been very slack on the deadheading). But the heucherella has just started to flower. I do not know why it is out of whack, it is supposed to flower in the spring, but I am happy to take it. Such a delicate bloom. Yikes, just ignore that big dandelion in the picture, I didn’t notice it at the time, its days are numbered! The daylily is also on the move. I have been so happy with this combo that I need to enlarge it in the spring. Wow doesn’t that look great. Lovely colours. I love the colours together, when you are a floral designer, you are always looking for a bit offbeat combos. What a beautiful combination! I think it’s blooming because it’s so happy to be in your garden. What dandelion? Ha! Maybe I should not have pointed it out. It truly is a wonderful plant is it not? I love that even on a bad day [if that is possible] it still looks like a pile of the most beautiful fresh raked leaves…. mine has yet to flower but I believe Heucherella are later. Funny that this somewhat demure beauty has usurped the flashier H. Golden Zebra! Dandilion? Wanna trade it for a thistle that had, until yesterday escaped my attention? Yikes! Teza, I thought heucherellas flowered in the spring, my bad. I will have to check out her flashy cousin, reminds me of the ‘Patty Duke Show’, now I am dating myself. I agree with you Deborah, the leaf color of the heucherella is gorgeous, and the blooms are a lovely bonus. I’m sure next year its bloom period will normalize. I often find plants are out whack the first year the garden, especially if they’ve recently spent time in a greenhouse. Very true, Clare. Now she will have to live in the big, bad world. I simply adore foliage in the garden and this heucherella is one that I have never come across before. It does have nice foliage along with good strong flowering stems. I’m sure the bees love those blooms just now. I think plants always need atleast a couple of seasons to settle into their correct flowering period and I’m sure it will settle eventually. I had to really look for that dandelion – but while looking for it I noticed your red barron grass thats also in the picture. Thats a nice combination. I can’t believe you haven’t seen it Rosie, maybe it hasn’t crossed the ‘pond’ yet. Be sure to search for her, I think she would look lovely in your garden. What a pretty combo and wow to that foliage! I am very happy with her. Dearest D, I think , like you, that it is so important to consider foliage and texture in the garden rather than to focus on flower power. Plants must earn their garden space and flowers are generally all too fleeting to make them the most important consideration. Edith, I was so happy with her, before she even flowered, such great colours. And not once has she ever looked ‘ratty’, we will see how she winters. Get her Rebecca, she has looked great every day since I have planted her. I bought ‘Sweet Tea’ late last year Deborah and she did not flower until well on in the summer. I think that plants sometimes get out of synch for a while before they settle in so perhaps next year we’ll both have spring flowering ‘Sweet Teas’. Isn’t she a beauty? Good to know that I am not the only one out of synch, Anna. Pretty color combo. Coralbelles do not do so well for me. I have a friend that has them seeding like weeds, but each time I plant them, they come back like miniatures. Tiny little leaves. It looks like a normal size plant, only a couple inches tall. I have never heard of that before, strange. I have not had them seed, it is one of the few plants I deadhead, maybe I should stop. Heucheras and all their friends and realations are really popular over here and now. But it was the pansy that made me feel weak at the knees! 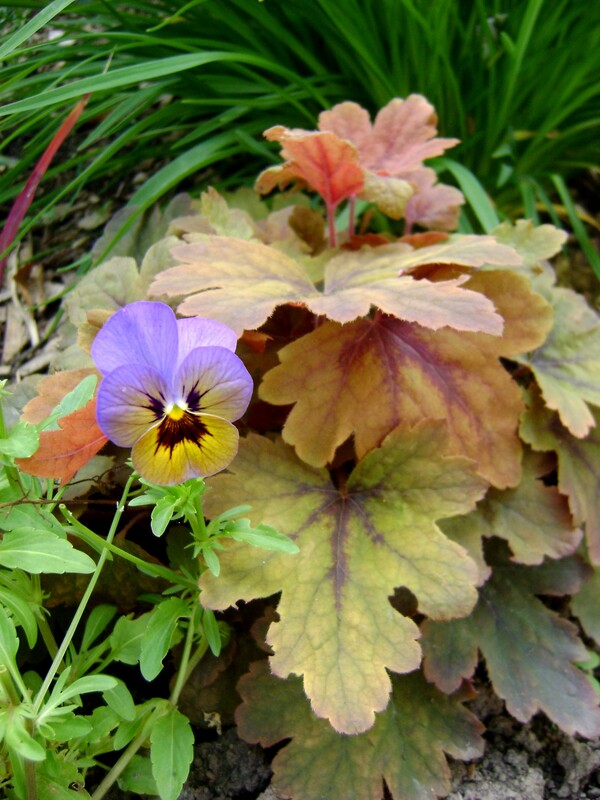 Catharine, I love that pansy as well, I hope he is growing them again, I will purchase a whole flat! I am becoming more and more enamored of heuchera as each season passes. There are so many fabulous foliage colors available. Your combination is especially pretty. I will be on the lookout for ‘Sweet Tea’. With a name like that, it has to grow well for me! Sweet Tea would be a gorgeous addition to your ‘Lady Garden’, I hope you can find her. I have to agree with Teza, it looks like a glowing mound of autumn leaves. Stunning! Autumn is my second favourite time of year, so I like leaves any way I can get them. I love that first picture especially. I think it is beautiful. Ooooh Joy, I am going to have to check the relatives out, they sound yummy! I need more Michael, violas, not dandelions, lol! 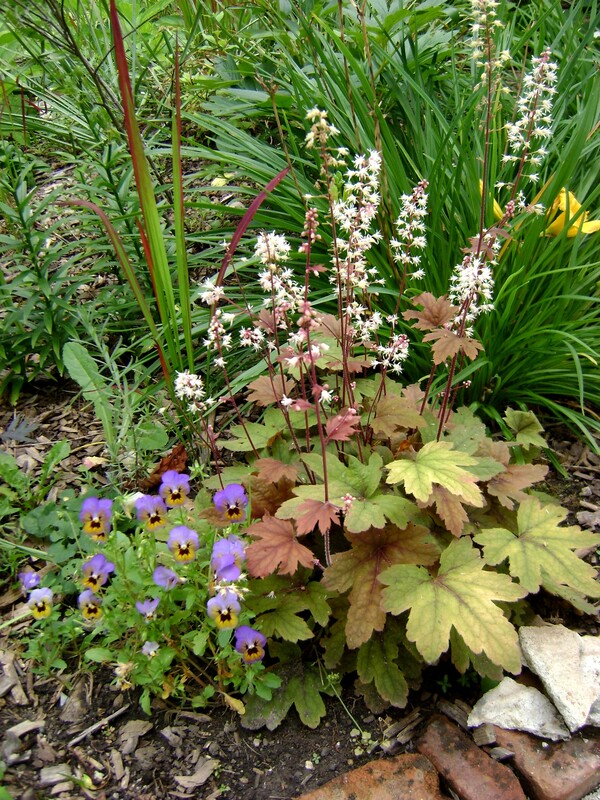 I love the heucherella – and its little sidekick next to it! I bought a bargain heucherella that was supposed to be a dark red/maroon, but it’s definitely more of a pretty brown. I really like it too! This is the first heucherella that I have had, I will definitely get more. I am into purple at the moment. Purple fountain grass, rhoeo, cordyline etc. Foliage colours counterpoint blooms so well. Thank you for the favourite at blotanical. Back at you! I saw your purple fountain grass, gorgeous! Also love the viola – she (definitely a she to me) seems to be standing in front of the group picture waving and saying “Look at me! Look at me!” At least, that’s how it looked when I scrolled back up for a second look. The first look I only noticed the lovely blue against the wonderful leaves of Sweet Tea. Ha ha, guess I am not! I just try to (usually) shoot around the dandelions. She is a bit of a brazen hussy, isn’t she, and I like it! Thank you for the article, I did also grow Hecherella Sweet Tea this spring and loved it, seems quite vigourous and what an outstanding color.. I love the colour as well, and was very happy with its performance. More Sweet Tea in in my future. Thank you for visiting my blog and leaving a comment, I hope to see you again soon.